Research endeavours undertaken in the recent past by the Division of Arachnology of Sacred Heart College, Kochi in India, under the leadership of Dr. P.A. Sebastian, have lead to the discovery of many new spiders from "Western Ghats" in southern India, one of the biodiversity hotspots of the world. 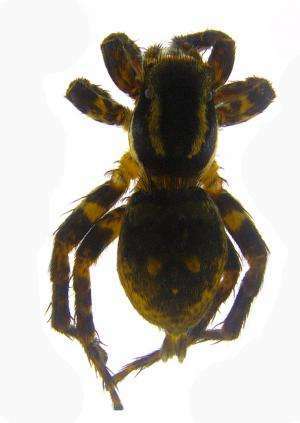 Their new finding is a little jumping spider belonging to the family Salticidae and genus Stenaelurillus. 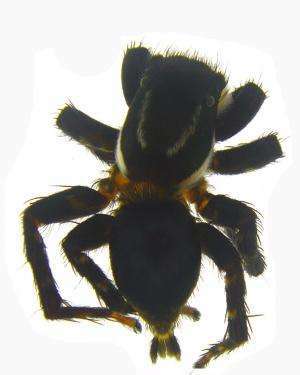 The new species has been named as Stenaelurillus albus, owing to the presence of a unique whitish area on the tegulum of the pedipalp - the copulatory organ of the male spider. The study was published in the open access journal ZooKeys. The new spider, along with Stenaelurillus lesserti, another species that has been re-described in this paper are remarkable for the presence of mating plugs or copulatory plugs, which are supposed function as the paternity protection devices. 'Mating plugs are not very unusual in the animal kingdom and their presence has been described in a number of spider families including Salticidae', said Dr. Sebastian. 'However, it is interesting to note that they have been reported in only 17 species of the approximately 5800 jumping spiders described so far', he observed. Mating plug was observed in the female copulatory opening of both the species described in this paper. The left copulatory opening of both S. albus and S. lesserti were found to be sealed with amorphous secretions. Compared to S. lesserti, the mating plug of S. albus was more prominent and covering nearly the whole area of the left copulatory opening and the surrounding female reproductive region. With the discovery of the new species, the genus Stenaelurillus is now represented by 28 species, majority (21) from Africa and the rest from Asia including India, Sri Lanka, Vietnam, Iran, China, Nepal and Tibet. All are medium sized spiders, with their anterior region (prosoma) bearing two white transverse stripes on the dorsal side. 'Another notable feature of these spiders is the presence of strong bristles around the eye region in both males and females' opined Dr. Sebastian.